Nothing – apart from little one of course! Everything is provided for, including mats, blankets and cushions. There’s also some toys for the children and you’ll even receive some print outs of any songs we sing so you can join in from the start. Session prices can vary according to the location but they’re usually priced around £4 – £5. Absolutely not! 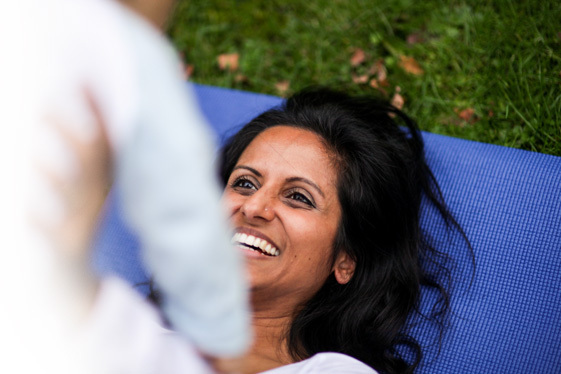 Any yoga poses given to mums are suitable for beginners. They’re gentle and restorative, aimed at assisting your body’s realignment after birth. If I’ve had a caesarean or other birthing complications can I still come along? Yes, 8 weeks after giving birth you are able to take part in the class, but if you have any concerns about your health it’s always best to seek advice from your GP first. What if my baby cries, needs a feed or a sleep – will this disrupt the class? No – not at all. You need to meet your baby’s needs first so if that means we have some babies sleeping, or feeding or needing comforting then please don’t feel you’re disrupting the class – you can meet their needs in the room or leave for while if you need to – whatever you’re comfortable doing. What age babies are welcome? From 8 weeks to 18 months. I’m in – how do I book on? hello@yogamums.co.uk and I’ll get right back to you.